The Buckeye Model K-150-SP is a Dry Chemical wheeled fire extinguishers made by Buckeye. Online Safety Depot carries several models of wheeled Purple K fire extinguishers with the Buckeye Model K-150-SP being the most popular. Designed with a 50-foot hose, and well-balanced design allows for a single person to transport the unit through doorways, around corners and into hard to reach places to extinguish any Class B and Class C fires. The Buckeye Model K-150-SP can be fitted with a tow loop on the top of the unit making it easy to transport by any vehicle that has a hitch installed. Additionally, the Buckeye K-150-SP is rechargeable and can be modified to a stationary unit. Wheeled fire extinguishers, such as the Buckeye Model K-150-SP, can be found in warehouses, commercial buildings, chemical plants, construction sites, storage units, refineries, shipboard use, research buildings, military bases, loading docks, and any other building, businesses or area where a more significant Class B and C fires may occur. The Buckeye K-150-SP has an agent capacity of 125lb. The extinguisher uses a potassium bicarbonate-based agent which is designed for Class B, and Class C fires. A = The Buckeye Model K-150-SP is not suitable for Class A Fires. B = The number 320 that precedes the letters B:C is the number of square feet that the extinguisher can cover or is able to extinguish. Therefore, a 320B equates to being able to extinguish 320 square feet of a Class B fire. Note: While the Buckeye Model K-150-SP can be used on Class C fires, It is not designed to be used for fires that involve sensitive electrical equipment. The agent, potassium bicarbonate-based agent may damage the electrical equipment. 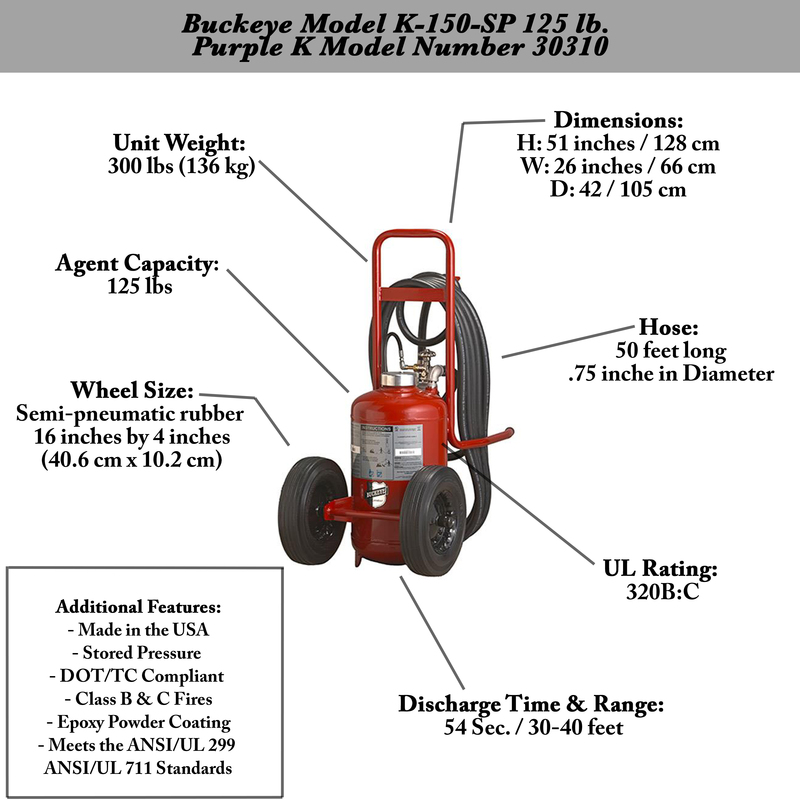 The Buckeye Model K-150-SP is a Dry Chemical, Purple K fire extinguisher. The Buckeye Model K-150-SP has a discharge time of 54 seconds of continual spray and a range of 30-40 feet. However, environmental conditions such as the wind, temperature, or humidity may affect the effective discharge range. The Buckeye Model K-150-SP weighs a total of 300 lbs (136 kg). The Buckeye Model K-150-SP is 51 inches (128 cm) in height, 26 inches (66 cm) in width and 42 inches (105 cm) in depth. The Buckeye Model K-150-SP comes fitted with a 50-foot hose and is .75 inches in diameter. 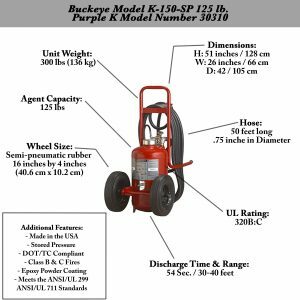 The Buckeye Model K-150-SP comes with Semi-pneumatic rubber wheels that are 16 inches (40.6 cm) by 4 inches (10.2 cm). Is there a smaller Purple K Wheeled Fire Extinguisher available? Yes. Buckeye fire equipment makes 50 lbs wheeled Carbon Dioxide fire extinguisher that is smaller than the Buckeye Model K-150-SP. Can the Buckeye Model K-150-SP be used on oil rigs or boat docks? While the Buckeye Model K-150-SP built to withstand harsh environmental conditions, fire extinguishers that are used offshore on oil rigs or along the coastline where the extreme weather environment may cause rust or damage to the fire extinguisher, it is recommended that an offshore fire extinguisher is used. The following purple K wheeled fire extinguishers are designed specifically for offshore use. Offshore fire extinguishers are coated with several extra layers of galvanized compound to prevent rust and corrosion that may occur. Can the Buckeye K-150-SP be used on sensitive electrical equipment? NO! Only fire extinguishers that use residue-free extinguishing agents, (clean agents) are suitable for sensitive electrical equipment. The two clean agent fire extinguisher types are Carbon Dioxide, and Halotron I. Purple K fire extinguishers (potassium bicarbonate-based agent) may further damage the electrical components. Next post: Which Public Safety Workers Should Wear High Visibility Reflective Safety Apparel?